Reportedly to never again sing in public, Frank Sinatra remains one of the dominant personalities and stylists of American pop music. His phrasing, his stage persona, his ability to convey emotional vulnerability when performing have all become the standards by which other singers are judged. RCA Victor (now owned by BMG) has reissued some of the earliest Sinatra sides, when he was with the Tommy Dorsey band from 1940-42. There are absolute gems on here  a version of "Stardust" to rival Bing Crosby's, "The Night We Called it Day" and "The Song is You"  and complete dross  an utterly forgettable song titled "Dolores," an abomination (sung as well as it can be) titled "Violets for Your Furs," and a Sammy Kaye-ish "The Lamplighter's Serenade." What these recordings show above all is that from the beginning of his career, Sinatra has been at his best in front of a top-notch big band. From the Harry James and Dorsey outfits, he went on to make some of his best recordings with Billy May in the '50s and some of his most relaxed sides with the Basie band in the early '60s. What he needs is an orchestra that can set the mood and then get out of his way; on that, the Dorsey band was certainly competent. 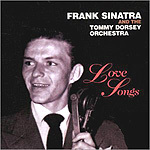 These historic recordings also show that whatever faults Sinatra the man may have  and he has plenty of detractors to itemize them  Sinatra the artist has always bared his soul when singing; he opens himself up to his audience in complete emotional supplication in a way only a handful of other singers ever have approached (Billie Holiday and the early Elvis come to mind; and Johnny Cash at his best). This CD shows, in short, why Sinatra is largely responsible for defining what we call American popular music.